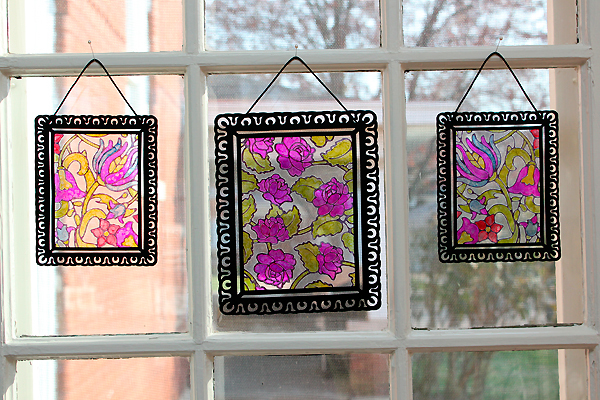 I have a fun tutorial for you today to show you how to create faux stained glass using your Cuttlebug Machine and alcohol inks. 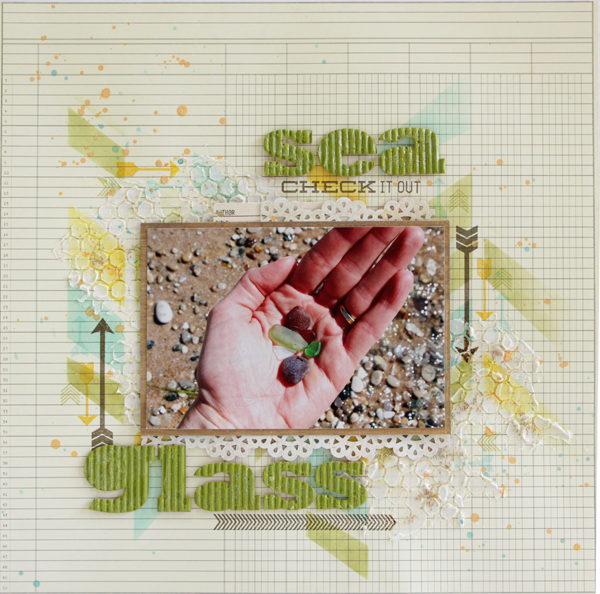 I was inspired to try this technique when I saw the Cuttlebug Summer Set of embossing folders and a friend of mine who creates real stained glass. This technique can be used with a lot of the embossing folders that are available and the design possibilities are endless with the use of different patterns and colors. 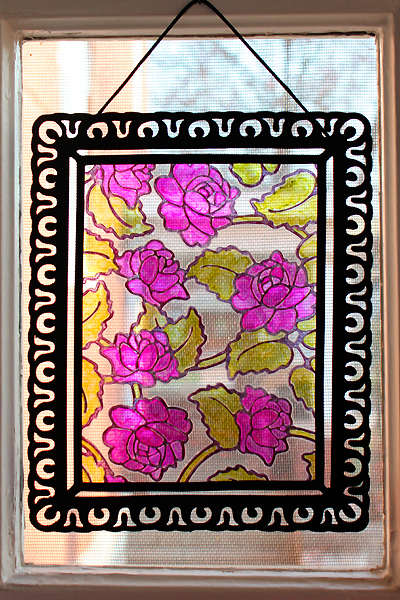 Here is my completed project hanging on the door in my scrappy room with the sunlight coming through! 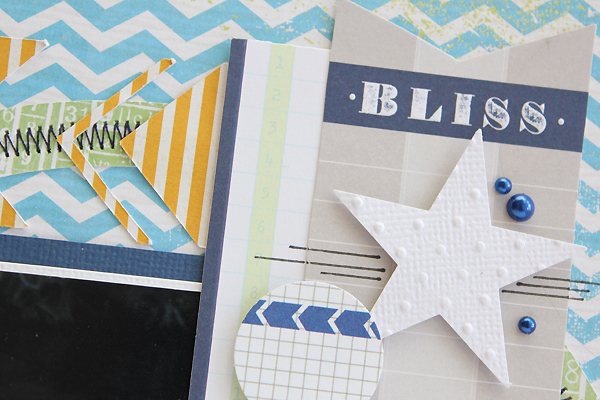 Read on to learn what supplies you need and how to create this project yourself. 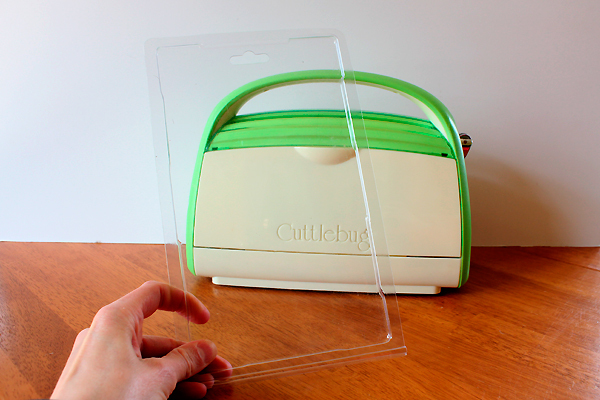 First you are going to begin with a piece of plastic packaging. 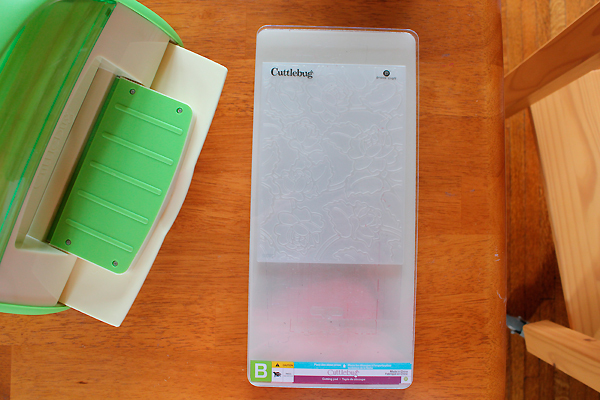 I used one piece from a Cuttlebug Embossing Folder set (these are larger) and a piece from a Cricut Cartridge. Trim off the edges. 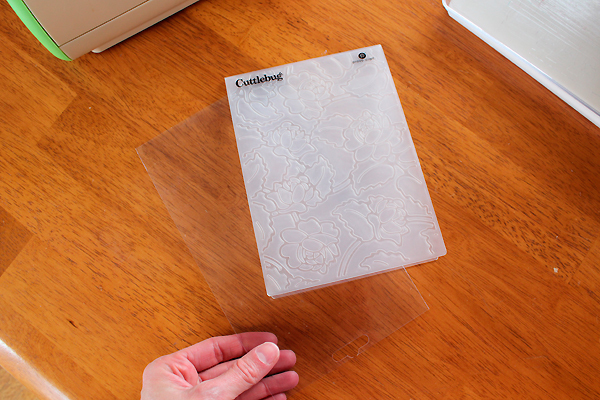 Sandwich the plastic inside the embossing folder. Layer it on top of the C Plate and under two B Plates. Run it through your Cuttlebug machine. 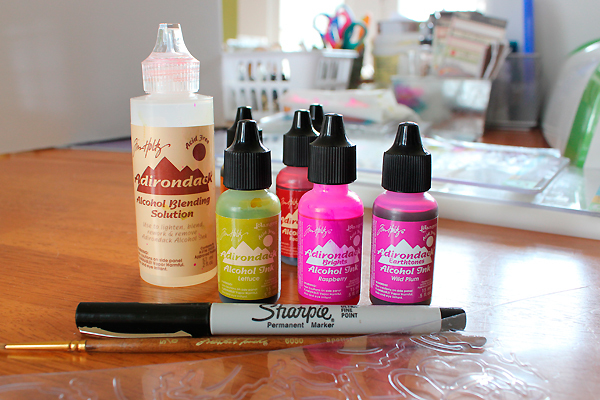 Now you will need the Sharpie and Alcohol Inks. These are some of the colors I used. The ones in the back are Red Pepper, Denim and Butterscotch. 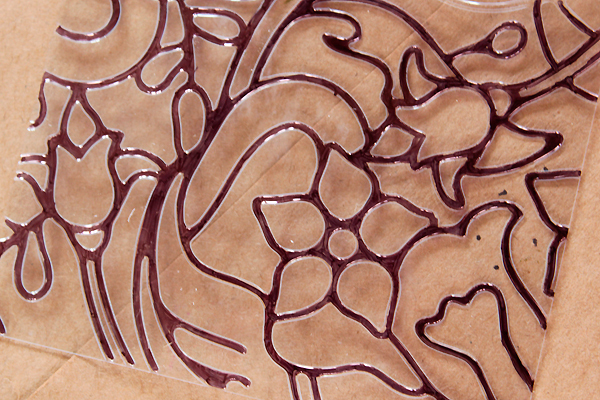 Take the Sharpie and color in the debossed lines that form the outline of the images. I found that coloring small sections at a times works best. 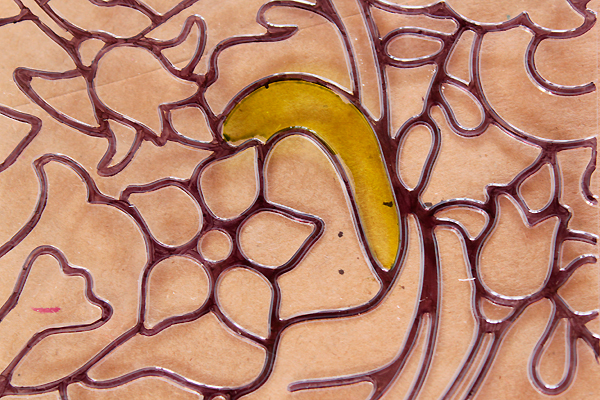 If you try to color over a section that is partially dry you will notice that the marker will try to remove the ink. If you missed a spot that you partially colored, wait until it is thoroughly dry and then go back and touch it up. Another great tip that I did was to do all of these coloring and painting steps on a paper bag…like the ones you can get at the grocery store. Another great way to recycle! 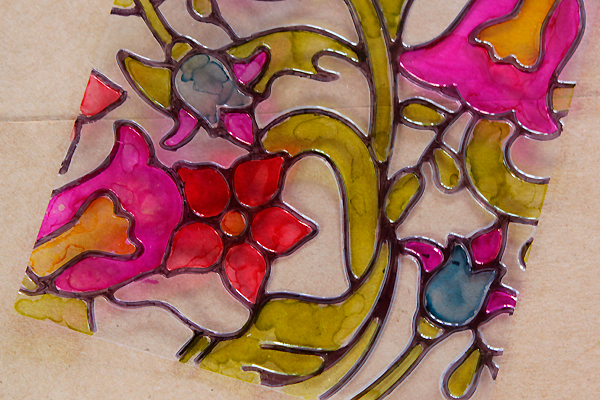 Next you are going to start coloring in the image using the alcohol inks. 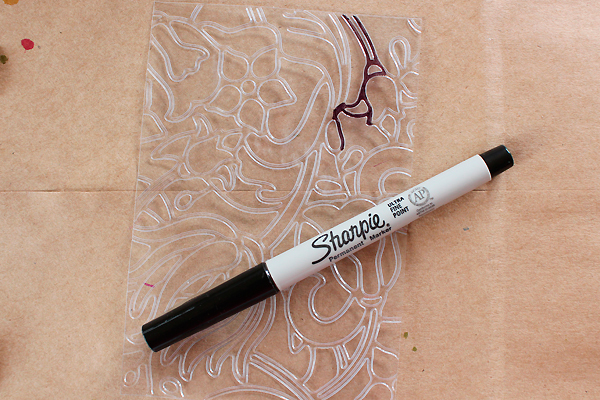 Flip the plastic piece over from the side you colored in the outlines. Now you are going to paint in the larger sections of the image that are debossed. The black colored lines will act as walls to hold the ink in place until it drys. I added ink to my brush by tipping the bottle to the brush and then gently squeezed the bottle to add a drop or 2 of ink to the tip of the brush. 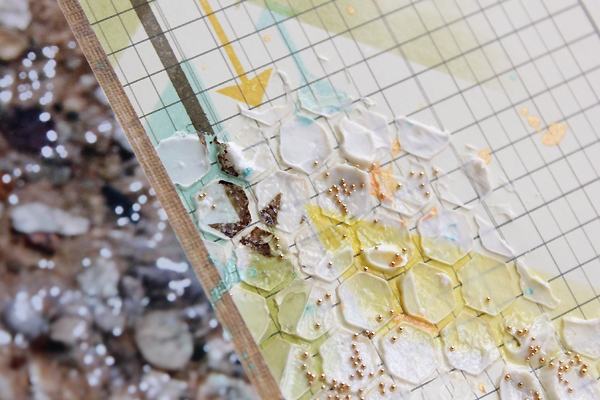 Do this to the side of your project to avoid any unwanted drips. Then simply color in the sections as you like. I colored all of one color at a time. 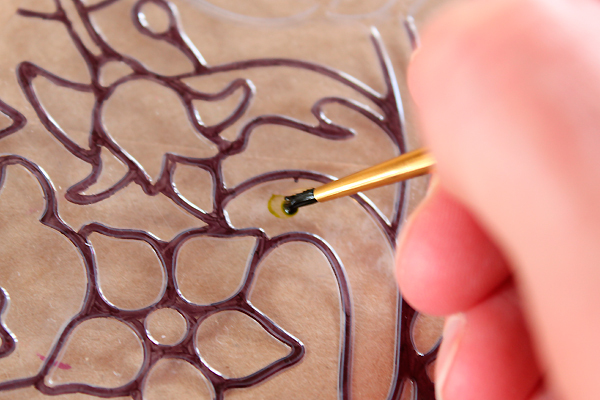 To get the mottled look, go back and add little touches of ink once your first layer of ink is dry. You can also play with the Blending Solution as well. Now that your piece is completed, you are ready to add a frame. I created a frame using the Fancy Frames Cartridge and Cricut Craft Room. I sized the inside of the frame so that it would slightly overlap the edge of my “stained glass” piece and I cut 2 of them. 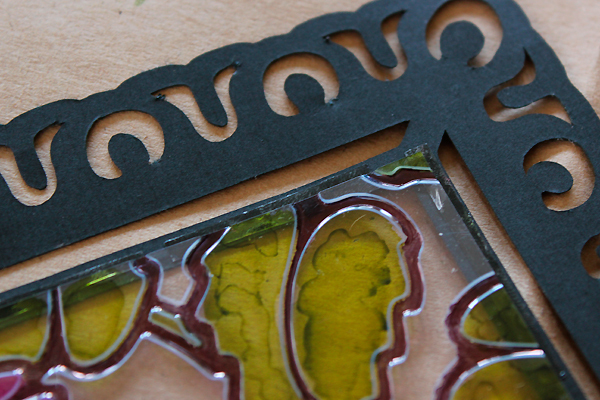 You are going to sandwich your piece between the 2 frames so that it looks finished from both sides. 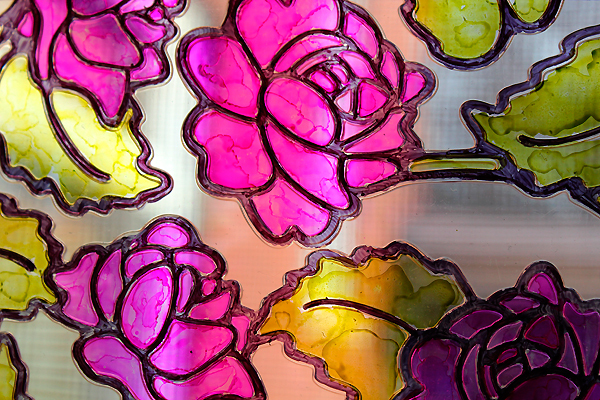 Once they were cut out, I adhered one of them to one side the “stained glass”. I tried 2 different methods. One was using Terrifically Tacky Tape. This was a bit difficult since the tape had to be cut in half length wise because the frame was so thin. This is what is pictured above. The other option is to use Ink Essentials Glossy Accents. This was a bit easier with the thin edges on this particular frame. Before you adhere the second frame, cut an 8 inch length of ribbon or cording to use to hang your piece and attach it to the corners of the frame using the Glossy Accents. The cording/ribbon is also sandwiched between the 2 frames. 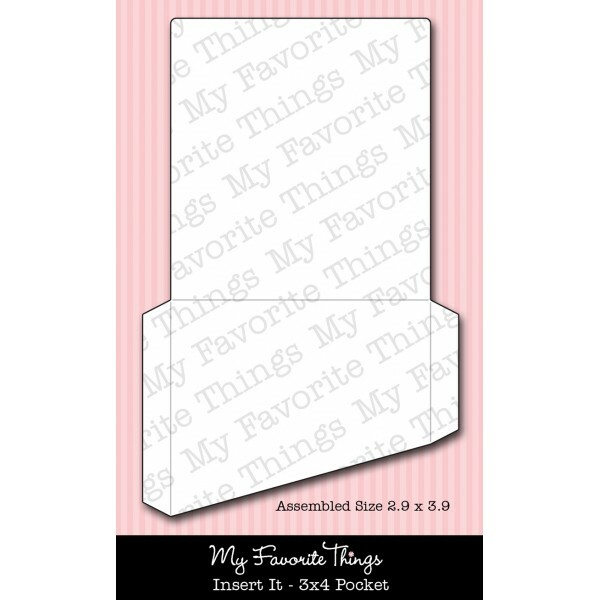 Now you can attach the second to the backside of your piece. 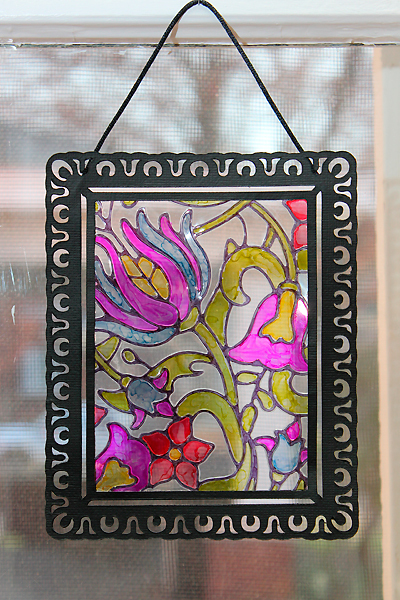 Your faux stained glass piece is now completed and ready to hang in a window and enjoy! 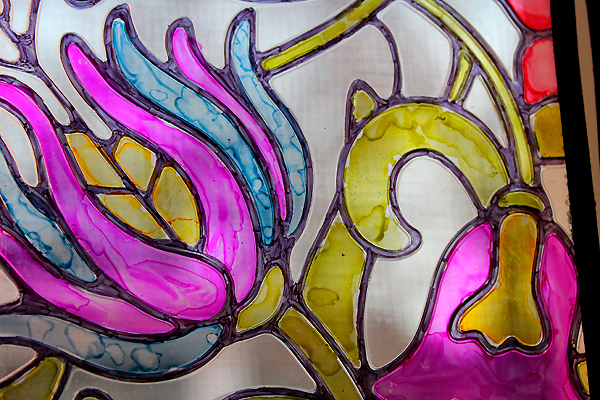 Here is a close up view of the other piece I created. 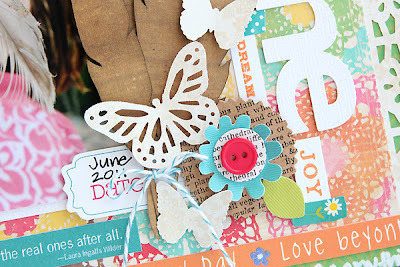 I hope you enjoyed this tutorial and project as much as I enjoyed creating them to share with you! 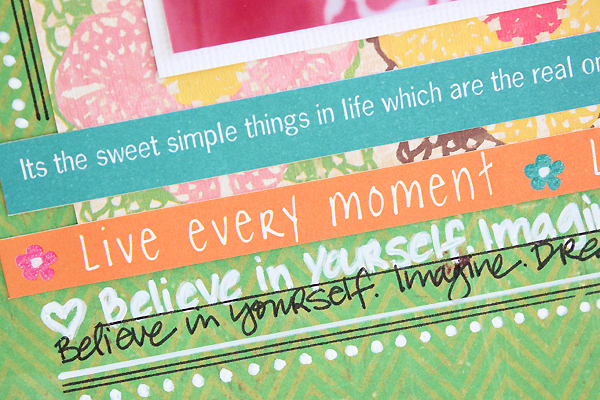 The layout I have to share with you today is using a bit of old mixed in with a bit of new! 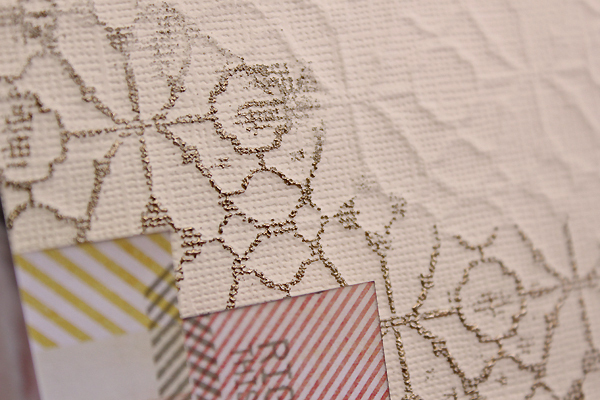 I have had this photo and these patterned papers together for a very long time. We won't ask how long!!! I found them together and decided that I should sit down and take the time to finally scrap this photo of my niece when we went on vacation together a few years ago. I love this photo of her! It really captures her personality. She still loves to pick up things she finds outside, no matter what it might be, and examine it! She has been known, relatively recently I might add, to have tried to pick up a snake that she thought was a big worm!!! LOL!!! Now let's talk about the old and the new that I mentioned above. 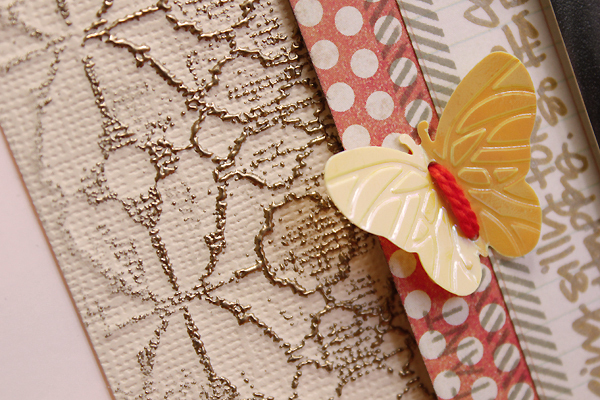 The patterned papers I used are from Crate Paper and are from various collections. 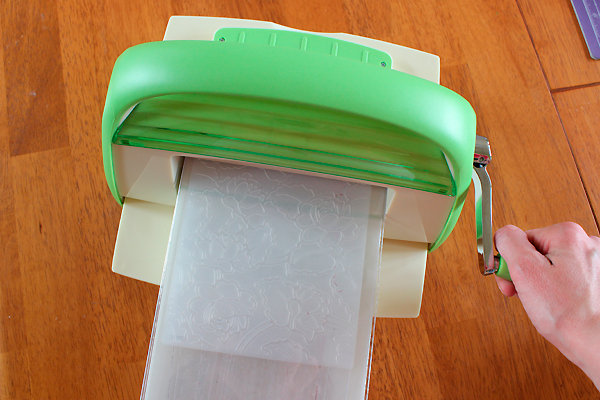 I used some decorative scissors to trim around the outside edge of the green paper. Using these papers was the old I was talking about. 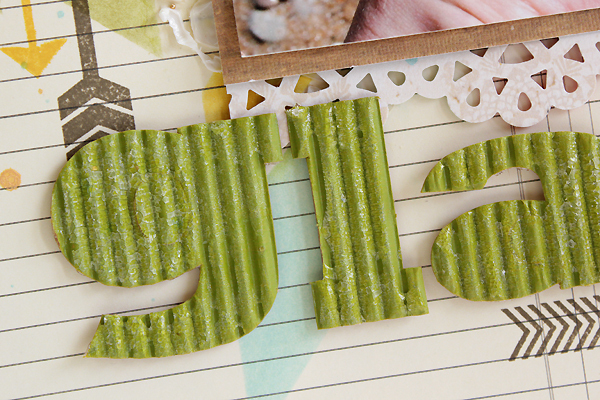 The new is the fun feathers I cut from the paper using my Silhouette Cameo. 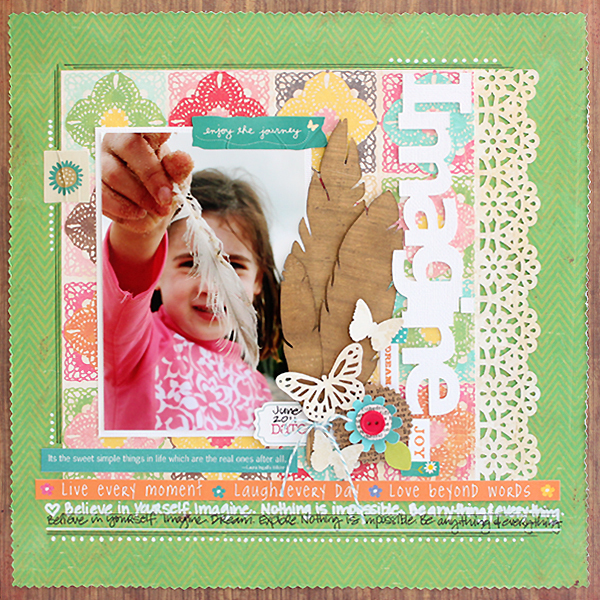 The cut image I used is Feather's Set by Emilee Stucky. I wasn't too sure how I felt about the trend, but having a photo of someone holding an actual feather helped me jump ship! I am loving this look. They are a rather neutral image to add and due to the nature of their shape they add a wonderful organic feel to the layout. If you look closely, you will notice that the feathers are cut from the same paper as the base of the layout. When I mat a layout like this, I frequently cut out the middle of the background/base paper and save it to use for other layouts or in this case to use for cutting out the feathers. 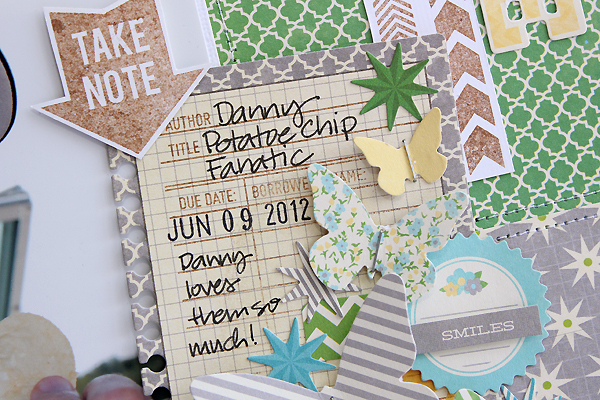 Something else that is new on here is that gorgeous doily border punch! I first saw this on layout by Nicole Doiron and I knew I had to have one. That was months ago. I finally found one when I was in Cleveland at a super cool craft store called Pat Catan's! I am pretty sure I will return there frequently, but let's not tell my husband how often!!! 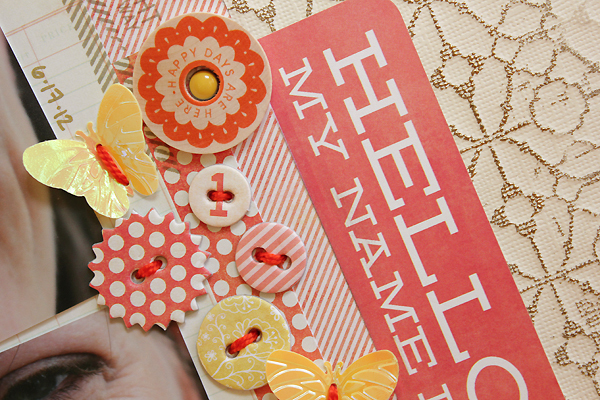 I finished off the layout using a combination of stickers from Little Yellow Bicycle and Pebbles. So are you using feathers on your layout? If so, what kind? 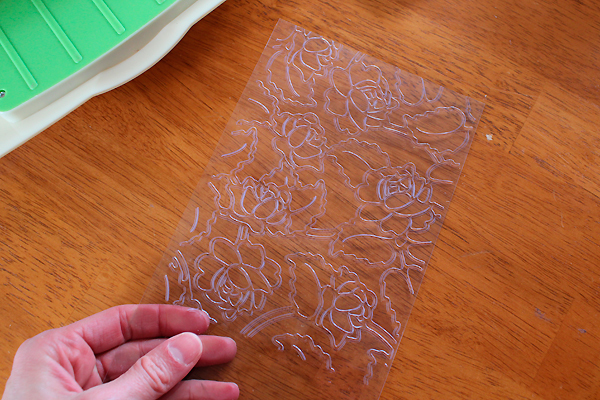 Are you die cutting them, hand cutting them or using real one? I'd love if you would link me up to one of your projects using them! Starting today our big move begins. The house is being loaded onto the moving van today and we will move into our new home on Thursday. I can NOT wait!!! I have pre-scheduled this week's and some of next week's posts because I am not sure when the internet will be turned on at our new house. Planning ahead and organizing are my middle names! LOL!!! Anyway, let's get to why you are here. 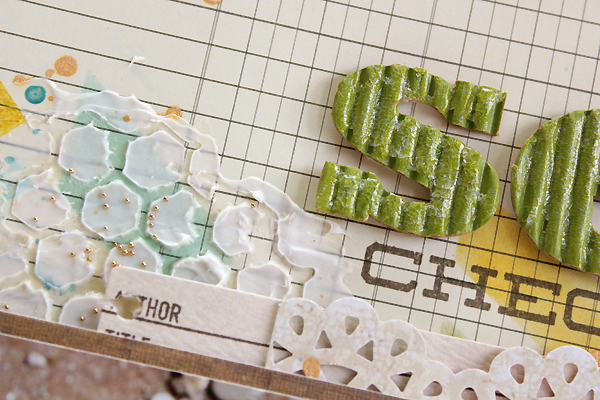 Yes, I played with the scraps from my table!!! 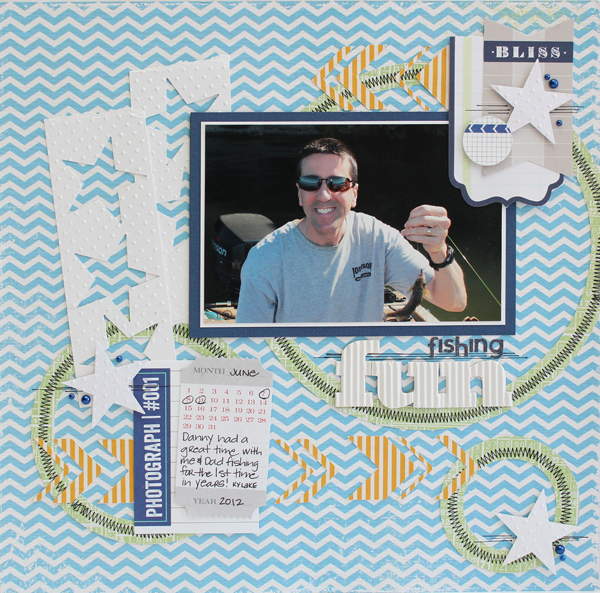 I created this one quite some time ago using what I found on my scrap table after making another layout: the negative star strips, the stars, the circles and the chevrons. I never do this because I always completely clean up my table between each and every project. Silly maybe, but I feel like I work better that way. I will say I am pleased with what I created using my scraps though! I really like the funky feel of the design including the fun zig zag stitching around those die cut circle pieces! I also used an pen and ruler to add some lines here and there on the layout for a fun little touch. I appreciate your visit and I ask that you consider following my blog now with Bloglovin'! As of July 1, 2013 Google Reader will no longer exist. I have started using Bloglovin' and I really like it. It is simple to use and it easily added all of the blogs that I currently follow. Plus, I love how they send you an email every day (if you want it) with a list of all the new posts for the day! 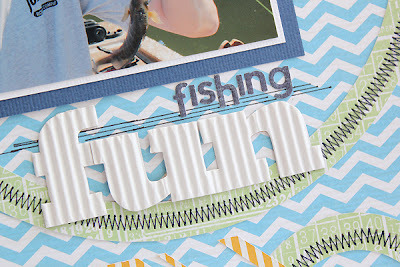 Today I wanted to re-share a couple of my recent layouts and bring your attention to the awesome stamps and dies that I used on them. They are designed by the fantastic Laina Lamb for My Favorite Things. 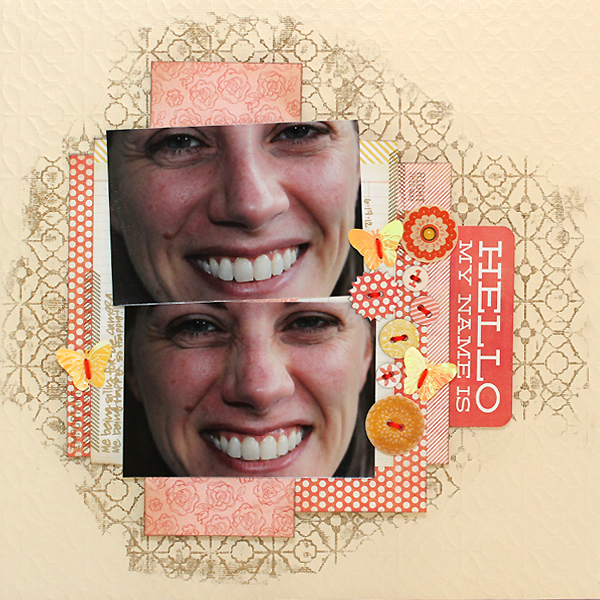 I was blessed to have been sent two of her stamp and die sets to play with from her February release. 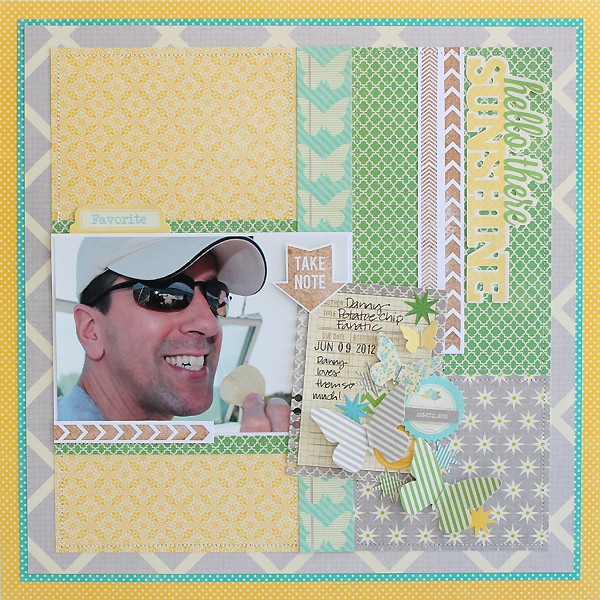 My first layout used a combination of both stamp sets and the Notebook Paper die. 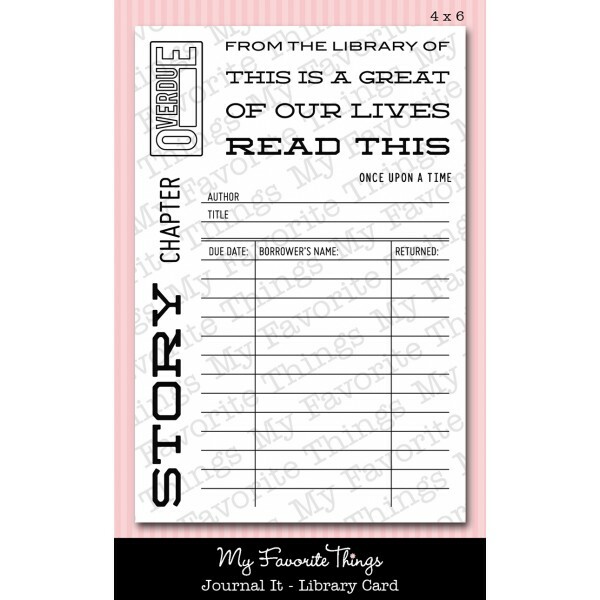 I die cut a journaling card that I cut from a piece of the Jillibean Soup patterned paper and then stamped it using the Library Card set. The stamp set I used was the Right This Way set. I stamped the images onto white cardstock using Ranger Distress Ink in Vintage Photo and then trimmed around them before adding them to my layout. On my second layout, which I just shared recently as part of my Core'dinations DT application, I used the Right This Way set again. 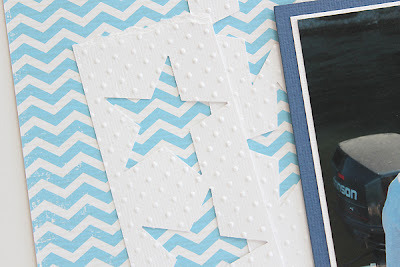 I stamped the long chevron/arrow shaped images along the border between two pieces of patterned paper. I also used a couple of the word stamps and I stamped these directly onto the patterned paper as well using Ranger Distress Ink in Frayed Burlap. These provide a soft subtle accent without being too distracting. For my third and final layout, I created an art journal type layout by playing with some Gesso, micro beads and crackle paint as well Laina's fabulous stamps and dies. 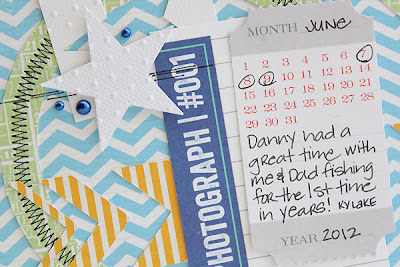 I used the 3x4 Pocket die to create a place to put my journaling and then I hid the pocket behind my photo. 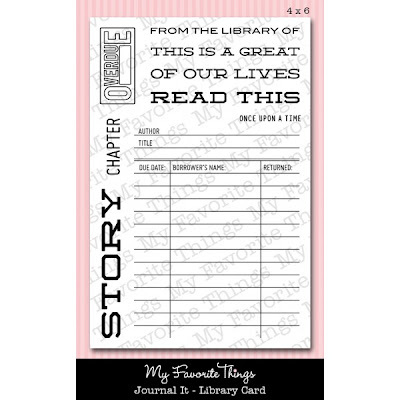 I die cut a piece of paper using the Notebook Paper die and wrote my journaling on this piece after I had stamped it with the Library Card set. 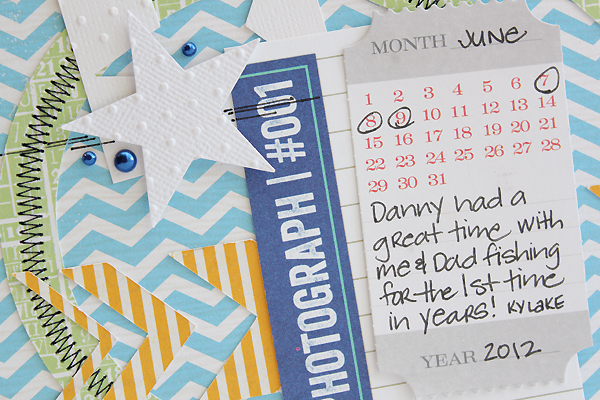 If you look close, you can see a peek of the Notebook paper die sticking out above the top of the photo. 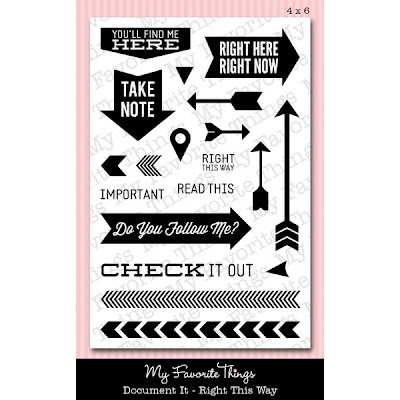 You can also see some of those fun arrow stamps at work here from the Right This Way set. Here is a better look at the full stamp sets and dies that I worked with. I want to thank Laina again for giving me this opportunity and I am hoping to have another opportunity in the future to play with more of her products as I truly fell in love with the quality of stamps and dies produced by My Favorite Things!